The Reeve's Turtle is making it smell and stinking of a few, etc.In a little large-scale turtle that lives in the river and the marsh, surgical knives are larger than males. As for the large one, the shell becomes about as much as 30cm. The surgical knife becomes large-scale than the male. The shell has various kinds of ovals long and slenderly squarish by the color like brown, ash brown, and the black, etc. The color thickens when growing up and the seam of the shell gets black at an infant smallness though the individual that yellow drove is a lot of. 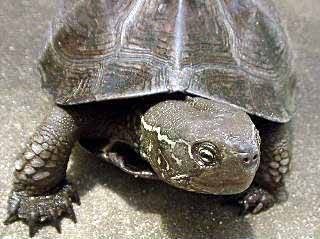 Breeding is oviparous as well as other turtles. It digs up sands left from the waterside, and production sees ten several-eggs at the June-August. The egg will hatch in about two months. It eats fishes, amphibians, the insect, the crustacean, and shellfishes, etc. by omnivorous. It was captured that a big turtle had been walking on the rice field road near the shop. They were made to smell and to smell. Therefore, it seems to have given such a name. It took a picture washing and it let it go. It ran away walking quite fast though it was said that it was slow that the turtle walked. Because passing the winter in outdoor is possible excluding the cold district, the feeding procedure can be bred with a pond in outdoor, that sunshiny is good and a large-scale water tank. The land to dry the body making the thing like the floating island from the tree, the block, and the stone is prepared. About 30-40cm in height should enclose it for an artificial pond so that the turtle should not run away to surroundings on the pond.